The agricultural situation in the state changed dramatically as a consequence of consolidation of holdings, availability of canal water, tube well irrigation and establishment (in 1962) of Punjab Agricultural University with strong research and extension education components that developed close interactive relationship with the state agriculturists. Introduction of dwarf wheat germ-plasm and cultivators from CIMMYT Mexico in 1964-65, which could easily stand to higher use of fertilizers without lodging and required assured irrigation, set the stage for wheat-based green revolution in the state. With this conducive production environment, assured remunerative prices provided by the government through price support and procurement system as well as spread of rural and approach roads network in the state, production and productivity as well as gross domestic product from agriculture sector started improving quite fast. Tractors and tube wells started dotting the landscape everywhere, uses of fertilizers and pesticides expanded and irrigated area as well as intensity of cropping started increasing. Even net sown area also increased. The cropping pattern started witnessing significant changes. The foundations of the Green revolution were thus laid and enabling infrastructural, technological and economic environment was rendered conducive for the interaction of elements of growth and productivity in the state. Dwarf varieties for Paddy crop was introduced and production increased manifold. By 1970-71 GDP of the state at constant prices increased to Rs. 1509 crores. The ratio of GDP originating from agriculture increased by 3.4 percentage. Thus agricultural GDP of the state increased by 86.5 percent from Rs. 473.7 crores to Rs. 866 crores in one decade. Net sown area increased from 3.76 million hectare in 1960-61 to 4.05 million hectares in 1970-71. Gross sown area increased from 4.73 to 5.68 million hectare and intensity cropping improved from 121 to 140 per cent over the same period. Cropping pattern underwent significant changes with area under wheat increasing from 29.6 per cent to 40.5 per cent of the total cropped area. Per cent area under pulses declined drastically from over 19 per cent to 7.3 per cent. By this time, new dwarf varieties of rice from IRRI were introduced and the area under rice production started expanding. As a result production of food grains in 1970-71, more than doubled to 7.3 million tonnes from 3.16 million tonnes in 1960-6, with wheat production increasing to 5.15 million tonnes. Rice had not as yet caught the imagination of the farmers although area under this crop and production had started increasing and the future looked bright. From here on agricultural sector growth made a quantum jump. Yet with the industrial and tertiary sector too growing fast, share of agricultural sector in the GDP started declining which was in tune with classic model of growth and development of any economy. This growth in agriculture initiated by green revolution in wheat crop production in late sixties and further fuelled by rice revolution in mid-70s, continued un-abated under conducive commercial environment both on production as well as market fronts. By 1993-94 GDP of the state had increased to Rs. 4565 crores at 1970-71 prices. Even with primary sector share declining to 46.76 per cent, Agriculture Sector GDP touched an all time high of Rs. 2135 crores which is an increase of 147 per cent over the Sector GDP of 1970-71. Net sown area increased almost to its limit of over 4.2 million hectares. With cropping intensity of 181 per cent, the gross cropped area increased to over 62 million hectare. In the cropping pattern, wheat occupied 43.7 per cent of the gross cropped area. With rice occupying 28.6 per cent area, the food-grain crops accounted for 76.9 per cent of the gross cropped area. The production of Pulses and coarse grains got marginalized. Relative area under oilseeds and sugarcane decreased to over 62 million hectare. In the cropping pattern. 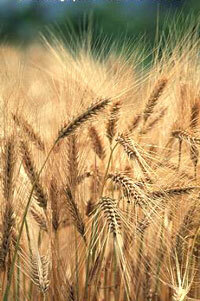 wheat occupied 43.7 per cent of the gross cropped area. With rice occupying 28.6 per cent area, the food-grain crops accounted for 76.9 per cent of the gross cropped area. Cotton area. however held on with marginal, yet fluctuating, increases overtime. During this period productivity improved dramatically with wheat yield increasing from 2.238 tonnes to 4.01 tonnes per hectare and rice from 1.765 to 3.507 tonnes per hectare. Productivity of other crops such as American cotton, sugarcane and potato also improved but not that significantly. This conducive economic environment gave impetus to expansion of tube well irrigation, tractor cultivation and intensive use of fertilizers As a consequence fertilizer use increased from 54 kg per hectare of net area sown in 1970-71 to 265.5 kg per hectare in 1993-94. Pesticides use increased manifolds. The number of tractors increased from 10 to 80.3 per thousand hectare of net sown area and tube wells number increased from 192 thousand to 850 thousands in the state. Area irrigated increased from 71 to 93 per cent of the net sown area. The intensity of cropping increased to 181 per cent. Production of food-grain increased to 21.58 million tonne, with wheat production at 13.34 million tonne and rice 7.65 million tonne. At present over 84 per cent of the total geographical area of the state stands cultivated. Only about 28 thousand hectare land is classified as cultivable waste. This meager area represents terrain, which are very difficult to cultivate. The state looks like a vast farmstead with only 16 per cent of its geographical area under cities, towns, villages, rivers, canals, roads, buildings, wastes, forests etc. There is, thus, little scope for expansion of crop cultivation horizontally. Vertically, the intensity of cropping is over 181 per cent. There is, thus, hardly any scope for increasing the intensity of cropping further with the present set of main economic crops grown in the state. The transmission of new technology infused new life into the state of Punjab, boosting cropping intensity to183%. Today, Punjab is the country's leading state in the field of mechanized and modern farming technology. Intensive agriculture demands the use of diverse machinery that saves the farmer time and labour. This comparative chart records the march of mechanization across the farms and fields of Punjab. Consolidation of small holdings which was done very speedily, made mechanized farming economically viable. Coupled with introduction of HYV dwarf varieties of crop and assured irrigation it resulted into manifold production of food grain. In 1955-56, the state government established Central Cooperative Banks to provide loans and other inputs to farmers through the Cooperatives. Farmers utilized easy credit available for purchase of tractors and other implements and inputs. Establishment of regulated markets with network of yards and sub-yards helped the farmer to get better price for their produce. This also helped the farmers to come out from the grip of moneylenders and other petty middleman.